James Gordon Brown (born 20 February 1951) is a British Labour politician, who was the Prime Minister of the United Kingdom and Leader of the Labour Party from 2007 until 2010. 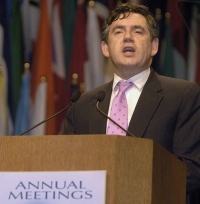 He took office on 27 June 2007, three days after becoming leader of the Labour Party. Prior to this he served as the Chancellor of the Exchequer under Tony Blair from 1997 to 2007. Private Eye reported in February 2006 that Gordon Brown has family connections to the nuclear industry. His younger brother Andrew Brown works for EDF Energy, the UK subsidiary of EDF, which operates nuclear power stations in France. Andrew Brown was appointed as EDF Energy's Head of Press on 13 September 2004. Previously, he worked for the lobbying company Weber Shandwick. In 2008, The Jewish Chronicle declared 'the top spots' on their second annual list of those who 'wield the greatest influence on British Jewry'. Brown is listed at number 29. The criteria for being listed is described as 'those with a vision for Jewish life in this country and who did their utmost to bring it about using either money; persuasion; religion; culture; political or social leadership; or simply inspiring through word and deed'. In order for someone to be listed in the top 20, it was generally necessary to demonstrate influence in more than one of the spheres. 'The Prime Minister may not have Tony Blair’s natural affinity with the Jewish community, but he has built on the good relations established by his predecessor. The government has extended its financial backing of sixth-formers’ visits to Auschwitz and Mr Brown has accepted an invitation to become a JNF patron. To rapturous applause, he told a Board of Deputies dinner last year: “Israel will always have our support. We will be a friend in good times and bad and we will never compromise our friendship for political expediency.” He is an admirer of the Chief Rabbi, whom he says he consults regularly'. Others included in the list were Lord Levy (number 9), Ron Prosor (number 10), Daniel Finkelstein (number 11), John Mann (number 17), Jonathan Freedland (number 18), Julia Neuberger (number 19), Lord Janner (number 20), Trevor Chinn (number 14) & Poju Zabludowicz (number 30). In a September 2006 article in The Sun written while he was still Chancellor, Brown evoked the spirit of the Cultural Cold War as a precedent for the War on Terror. When Britain and America set out to win the Cold War, we realised victory lay both in our military power and in persuading people under Soviet control to demand their economic freedom and human rights. It was a battle fought though books and ideas, even music and the arts, and it helped bring Communism down from within. So, as well as supporting our police, security services and armed forces in the front line of the war on terror at home and abroad, we also need to mobilise the power of argument and ideas to expose and defeat the ideology of hate. We should remember from 1945 the united front against Soviet communism involved not only deterrence through large arsenals of weapons, but a cultural effort on an extraordinary scale. Newspapers, journals, culture, the arts and literature sought to expose the difference between moderation and extremism. Foundations, trusts, civil society and civic organisations - links and exchanges between schools, universities, museums, institutes, journals, books, churches, trades unions, sports clubs, societies - all formed a front line in this cultural effort. And it was by power of argument, by debate and by dialogue that over time we changed attitudes and then changed systems. And so today the isolation of the extremists - and ultimately the end to terror - depends not just upon armies and treaties alone. In the long run, the way to defeat these people is through a competing ideology, see. And what's interesting about this struggle -- and this is what I was paying very careful attention to when Gordon was speaking -- is, does he understand it's an ideological struggle? And he does. As he said to me, it's akin to the Cold War, and it is, except the difference this time is we have an enemy using asymmetrical warfare to try to affect our vision, to try to shake our will. They'll kill innocent women and children so it gets on the TV screens, so that we say it's not worth it -- let's just back off. The death they cause makes it -- maybe we just ought to let them have their way. And that's the great danger facing the world in which we live, and he gets it. Matthew D'Ancona, one of the journalists accompanying Brown on the trip, also reported that the new Prime Minister emphasised the 'battle for hearts and minds' during the meeting. Bush was most nervous about what Brown would say on Iraq. But the PM kept drawing the president back to the need to engage in a cultural, intellectual and counter-insurgency programme of the kind that was fought against Soviet communism. D'Ancona suggested that the attempted terrorist attack on Glasgow Airport had led Brown to the analysis that "twisted ideas, rather than poverty, were the true basis of the problem." In the PM's eyes, it follows that the next phase of the struggle must be more subtle, much of it completely concealed. In this he has recently been inspired by a 1999 book on the CIA and the cultural cold war, Who Paid the Piper? by the British journalist Frances Stonor Saunders. He was particularly intrigued by the CIA's management of the Boston Symphony Orchestra as "the juggernaut of American culture". Brown cites the success of the anti-communist Congress for Cultural Freedom in harnessing the intellectual firepower of a generation of authors and artists, and funding journals such as Encounter, Transition and Partisan Review. D'Ancona added that Brown had been impressed by the work of David Kilcullen, and that his approach would owe something to that of Cold War strategist George Kennan. Does this mean that MI5 will now be spending millions on anti-Islamist magazines and that the London Symphony Orchestra is going to be dispatched to the Middle East with bugs in their cellos? Not quite. But it does mean finding resources for moderate Muslims and cutting off funding to anyone else: Brown believes that the old left's version of "multiculturalism" led us to the insanity of financing groups precisely because they were extreme. Expect big changes. It is said that Brown has been strongly influenced by the example of the cultural and intellectual campaigns fought by the west during the cold war, and in particular the account of them given by Frances Stonor Saunders in her book Who Paid the Piper? ; hopefully Brown's approach will prove to be more nuanced than that because the book is actually a warning about the perils of trying to advance democratic ideals through state-sponsored programmes, especially ones that deploy covert means. Stonor Saunders herself took a similar view according to Private Eye. Stonor Saunders told the Eye she was "dumbfounded" at Gordon Brown's apparent use of her book. She added, "If it is a sign he believes that some kind of dialogue is better than strafing and bombing, then good - but to look to my book for that is a complete contradiction. It tries to deliver a polemic about how ideas can be mismanaged and abused." In May 2007 Lord Sushantha Bhattacharyya donated £25,000.00 to Brown. Speaking engagements, Washington Speakers Bureau, September 2010. Approved by ACOBA, who saw "no reason why he should not take up forthwith, the normal three-month waiting period for former Cabinet Ministers having expired, provided that he does not draw on any privileged information that was available to him as Prime Minister and Chancellor". ↑ EDF Energy press release 'Andrew Brown to head media team at EDF Energy', September 13, 2004. ↑ Biography on Yvette Cooper's website, undated, accessed February 2006. ↑ Tony Cooper's biography on Nuclear Decommissioning Authority website, undated, accessed February 2006. ↑ Paul Richards, Brown: Enlightenement politician in age of emotion, Next Left, 30 July 2009. ↑ Gordon Brown, Chancellor Writes for The Sun, The Sun 8 September 2006. ↑ Gordon Brown, Full text of Gordon Brown's speech on terrorism: part two, guardian.co.uk, 10 October 2006. 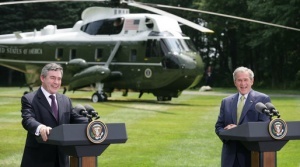 ↑ President Bush Participates in Joint Press Availability with Prime Minister Gordon Brown of the United Kingdom, Embassy of the United States - London, UK, 30 July 2007. ↑ Matthew D'Ancona, Brown is leading the way in counter-terrorist thinking, Guardian, 2 August 2007. ↑ David Clark, Muslim hearts are hard to win after years of hypocrisy, The Guardian, 15 August 2007. ↑ HP Sauce, Private Eye, No. 1191, 17 August - 30 August 2007, p6. This page was last modified on 24 December 2016, at 12:19.